This page to be developed as new links are received and reviewed. For now, here are some Sciency pages that I've bookmarked when I am looking into some treatment or therapy, or when I want to read some blogger's sciency review of some topic. "ASAT is a not-for-profit organization of parents and professionals committed to improving the education, treatment, and care of people with autism. Since autism was first identified, there has been a long history of failed treatments and fads, levied on vulnerable individuals as well as on their families. From the scandal of the “refrigerator mother” theory, to the ongoing parade of “miracle cures” and “magical breakthroughs,” history has been dominated by improbable theories about causation and treatments. Many of these treatments have been too quickly adopted by professionals, too readily sensationalized by the media, and too hastily embraced by hopeful consumers – well before supporting evidence or reasonable probability existed for their effectiveness or safety. Since ASAT was established in 1998, it has been our goal to work toward adopting higher standards of accountability for the care, education and treatment of all individuals with autism." Help people seek legal redress if they have been victimized"
"My mission is to blog truthfully, and often, with no regard to political correctness. If it has to be said, it will appear in the pages of this blog. We parents of children with autism have been given a huge responsibility and I have learned much in the past 20 years. Through this blog, I will share what I have learned. Hopefully, my experience will make your journey more efficient and less painful, and, ultimately, your child will benefit. " "Ben is a best-selling author, broadcaster, medical doctor and academic who specialises in unpicking dodgy scientific claims from drug companies, newspapers, government reports, PR people and quacks. Unpicking bad science is the best way to explain good science." "My name's Jon Brock. I'm a research fellow at the Macquarie Centre for Cognitive Science in Sydney, Australia. You can see my research profile and publications here." Really? Awful. At least his description of his blog will shed some light on what this is all about. . . right? Oh. . . succinctly put, Dr. Succinctly put. Anyway, love his posts. (This is Dr. Emily Willingham's blogsite. . . or one of them, I'll try to find out which she recommends. She's the science editor for "The Thinking Person's Guide to Austim" blog site, and she writes a parenting/slice of life blog as well. THIS site, however, is one I frequently return to as I juggle this whole Vax/Anti-vax thing. She may be guilty of many things, but unlike her colleagues above, succinctness is not one of them. She has a COMPREHENSIVE (did I mention comprehensive) timeline and discussion of the whole Wakefield anti-vax mess on this site. From her About me. . .
"The business of my life has been writing and science. The two together have led me to my current focus of how science and writing about science take shape around the audience known as You. This blog targets that interaction, homing in frequently on autism, an area of personal interest." Alright. . . That's it for now. I already have a couple leads on twitter that I want to research. I think I'll probably post some specific topic links to blog posts I've found useful at some point in the future. I'm irritated at my inability to post pictures in this blog WHERE I WANT THEM. And also, quite frankly, with my inability to get blogger to change the damn font color when I WANT the damn font color changed. So in the meantime, suffer through my formatting woes until I figure that piece out. Real Science vs. Fake Science: How Can You Tell Them Apart? 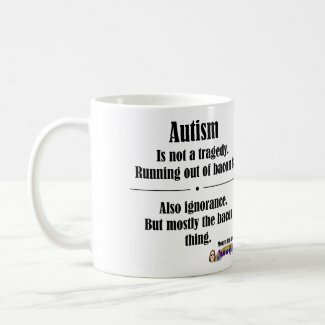 Thanks for posting "autism watch" - very useful IMO. Just ordered it. It's supposed to arrive early next week. I meant to reply to this a while ago. I've seen that book, and heard it's very good. It's on my Amazon "Wish List".